As I have contemplated Christo, I have tried to decide between his draped works and his wrapped works. Well, as it turns out, I did not have to decide; I did it ALL! The exhibit captures the essence of his work from inception to his current style. 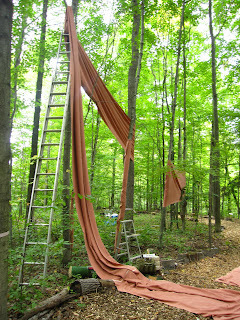 I have wrapped works, draped works, roped works, and even wrapped walkways within my interpretation. I had enough fabric and space to do the scope of Cristo’s career. James Lutke helped me hang my fabric. He is fearless and had boundless creativity. He scampered up the ladder without a second thought. I would have never hung Christo as high without his help. I am a big chicken when it comes to extension ladders. Steve will be glad to know I am not bringing it back home…one less thing to keep in storage! It is a dream to be here in Fruitport, Michigan at the home of Bob Frise, AIFD. He has so graceously prepared his property and his home to recieve his flower friends as well as the visiting public. We are all working toward the opening of the exhibit of Nature’s Creative Edge. I am delighted to be amongst such giving, kind, talented people. The AIFD family never ceases to amaze me. As the host, Bob could not be more generous. He fed us the most lovely lunch today: baked pasta! And bread! Baskets of fresh plums as well as plum and apricot desserts were yummy, along with his famous chocolate chip cookies, and those HUGE mutant chocolate chips! I snuck back into the house for extra cookies during the afternoon. One works up quite an appetite in the woods! The friendship and flowers are just so much fun. And the weather, the lake, the lighthouses…the houses and architecture…sublime! There are blueberry fields everywhere. It is nearing the end of the season, and I fully intend to take blueberries back to Southern Illinois with me! And blueberries will not be the only thing I take home. The friendships, the laughter, the inspiration, the memories will live far beyond the exhibit. I am so blessed to be a part of the experience.